Brandi Hofer Biography Brandi Hofer was born in Lloydminster, Saskatchewan in 1986. She studied in Red Deer, Alberta, at Red Deer College from 2004 to 2006 before transferring to the Nova Scotia College of Art & Design in Halifax, where she completed her Bachelor of Fine Arts in 2008. Hofer has worked in several art media including drawing, printmaking, painting, with oils and acrylics. She has recently moved to encaustic mixed-media painting and has developed her own self-taught technique in the medium. Hofer has long focused on female portraits and has explored themes of objectification, fetishism, the emotional self, and the female sexual psyche. Her new series is inspired by the music movement funk, the title of the series is "Bring on the Funk". Of her artistic practice, Hofer say, "My work and contemporary process is the by-product of my life experiences. My thought process revolves around colour, composition and the process of making the art. And in the immediacy of the moment my process describes my mood and perception of self. As a result the painting I am creating is the outcome of my subconscious environment. " Hofer's work has been shown in solo and group exhibitions in Alberta, Saskatchewan, Nova Scotia, Quebec, France, and has appeared in publications including Saskatchewan Arts Board Annual Report and Nightlife.ca. 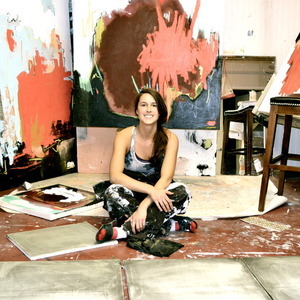 Most recently the online Saatchi Gallery has highlighted her work in their "One to Watch" category on their website. Hofer has been involved in the Saskatchewan Craft Council, the Edmonton Arts Council, and CARFAC Saskatchewan. In 2011, she participated in residencies at Red Deer College, Toronto Island and the Marnay Art Centre, in Paris France, and was part of artist Robin Lambert's project "The only thing I know for sure is that while I am looking for you, you are looking for me", in Montreal, Quebec. Brandi Hofer lives and works in Lloydminster, Alberta.